Keynote: What filling options can be used for the elements? 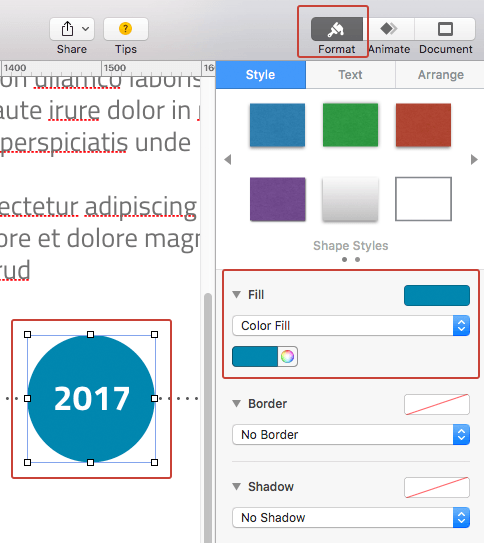 You can apply several filling options to any vector element in KeyNote. To make the list of options available you will need to: click on “Format” button in the top menu, select a vector element with left-click, you will see new sidebar where you have to select “Style” tab. The selected item is marked with rectangular frame with markers for zooming. “No fill”: the element is transparent without filling. “Color Fill” the element with uniform color fill. “Gradient Fill” a gradient fill component in two colors. You can choose the angle of the fill. “Image Fill” filling form with image. You can upload any image or texture in PNG or JPG. You can use zoom, repetition, or alignment with the vector element. “Advanced Image Fill” is similar to “Image Fill”, but also allows to overlay the color filter over the image.